Certainly the question of marriage looms large at some time in life on the horizon of all that are born of women. The desire to complete the circle of existence by the adoption of a suitable mate is inherent in the very alchemy of our being. So fully is this the case that for most natures the urge in this direction assumes almost the force of an obsession, and nothing appears of greater importance to the young while this influence maintains its control. It is possible to push this argument into the realms of the immaterial and abstract world and thus to derive the conclusion that the desire of the soul towards it counterpart in nature, and in its material expression the animal instinct, is after all but the urge of the spirit of life towards realisation. However, that may be, we are assured from all experience of marriage as a social institution, that it is capable of fulfilling the highest aspirations of the soul of man and of calling forth the best of his powers, and that more especially when he takes upon himself the dignity and responsibility of fatherhood. As to woman, there can be no doubt that her legitimate walk in life halts short of end if she fails to attain the crowning glory of motherhood. But even so, the estate of parenthood is not all that marriage intends and is capable of achieving for both man and woman. A tree is truly known by its fruit, and the tending of the tree of life from the sapling upwards is the whole business of a parent. Neglect in any stage of its development will assuredly leave its impress on the fruit of that tree. It has been wisely said that the foundations of all successful careers have been laid in early youth. Doubtless many elements combine to produce what we call character in the adult, but there can be little doubt that these are all represented more or less fully in diet, training, education, environment and custom, so far as the physical basis of manhood or womanhood is concerned. The question naturally arises as to the existence of an element which we may call Soul as supplying the urge towards individual development along definite lines. There is very much to be said for this as the cause of all individuality. If we take the case of a family, we may trace in its several members a reproduction of characteristics which are more or less marked in either the parents or ancestors. But these streaks of nature do not in themselves constitute character, still less do they define individuality. Yet, despite the existence of attributes or characteristics in common, it will be found that two members of the same family, fed at the same board, brought up under the same fostering care, educated in the same school, and very largely confined to the same general environment, are as different from one another as the proverbial chalk from cheese. Here I find a redheaded lad with grey eyes and freckled complexion, a little on the willowy side in development, but forceful and determined, impulsive and enthusiastic. His brother is dark in complexion of hair and eyes, has a full rounded face and figure, is somewhat slow and apathetic, but thoughtful and cautious, never acting except from motive, and generally unresponsive. Two characters, two appearances, deriving from the same parents and developed in the same surroundings. These are the little problems that we are brought up against when we come to consider questions of individuality and that deeper chemistry of life which finds it natural expression in mating and marriage. 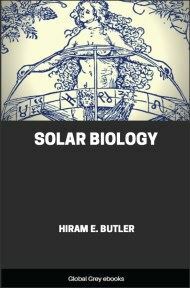 Now Astrology, the ancient science of the Chaldeans, teaches us that what we call character is the expression of the individual or soul, seen through the coloured glass of personality. The word personality is well derived from persona, a mask, for it tends rather to hide and obscure the manifestation of the individual than to reveal it. The body, in which we are logically bound to include all hereditary characteristics, is regarded as merely the instrument of the soul, and in this sense becomes either a help or a hindrance towards self-expression. It is as if a musician of acknowledged faculty were given an inferior instrument on which to play, or even one that is out of tune. Music as an abstract reality requires the musician to give it a humanised and coherent expression, but also the musician needs an instrument that is capable of responding to the requirements of his faculty. So that faculty, function and instrument are in the relations of spirit, soul, and body, and are mutually interdependent. 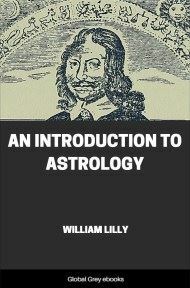 But it is also stated that the soul in man takes upon itself the characteristics of the body, as light takes upon itself the colour of the medium through which it passes, or as water takes the shape of the vessel into which it is poured; and it is this particular colouration of the soul which Astrology seeks to define. It argues that at the moment of birth the cosmical centres of force, the planets and luminaries, are so placed in the kaleidoscope of the heavens as to afford a definite colouration or set of characteristics in the personality then born, and that these positions of the planets, when properly understood and interpreted, define the conditions under which the individual will be required to manifest and function. As a science of life it certainly affords a better reason for the disparities existing between members of the same family than any other theory which has been advanced by the modern student of eugenics. 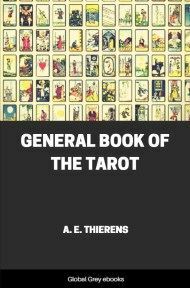 The theory is at all events worth a close examination, and although it would serve no good purpose to enter into a lengthy argument in this place, it will certainly be shown that there is good ground for accepting this theory as a working hypothesis. Acceptance of the cosmical theory will however entail a much wider conclusion than that which has respect to individual character. It will necessarily follow that, inasmuch as all others with whom the person may come into relations are similarly endowed with a planetary signature, so to speak, the result of this association of individuals will result in highly interesting effects. 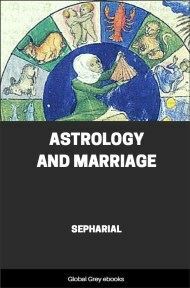 It is the province of Astrology to determine what those effects will be, and in fact to show aforehand what chances of happiness and success may attend the free admixture of the elements in one and another of them, and whether association of any sort, or the more intimate relationship of Marriage, should be allowed to transpire.